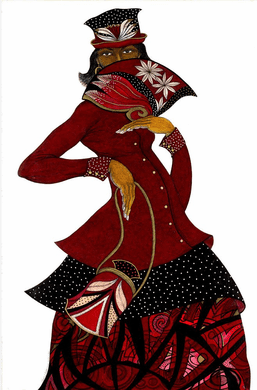 Charles Bibbs Hand Signed and Numbered Limited Edition:"Sister In Red"
Size: 34 1/2" x 21 1/2"
Edition: Artist Signed and Numbered, Limited to 850.
:About the Art This is a limited edition print by Charles Bibbs. There are 850 prints in this edition. Each print is hand-signed/numbered by the artist and includes a Certificate of Authenticity. The image dimensions are 34 1/2" x 21 1/2". This fine art Offset Lithograph Print, enhanced with a gloss coating on selected areas of the image. Paper: Heavy weight, acid-free paper.